Adding shared parameters to a project is often a pain because you can’t batch add them through Revit’s user interface. There are a couple of workarounds online that do the job just fine, like adding them using the “Transfert project standards” function. 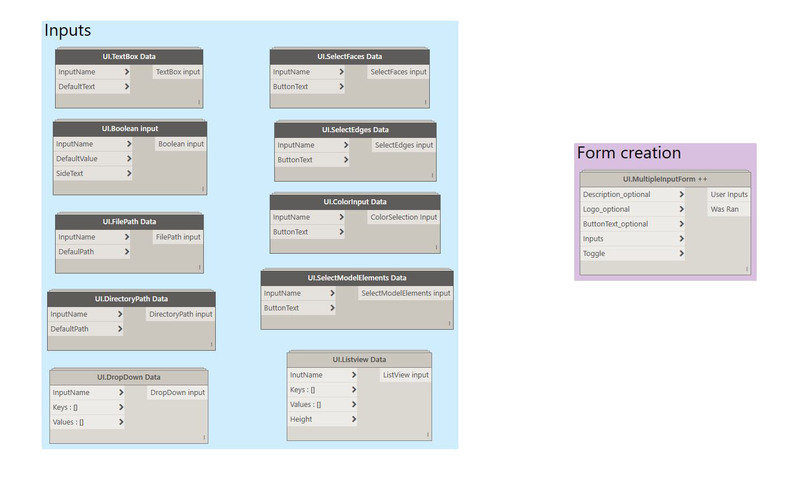 There are also great nodes from Archi-Lab to create/add shared parameters. But, I decided that I’d offer an alternative that allows you to use the “.txt” shared parameters file and gives a simple user interface, where you can pick the parameters you’re interested in and set the categories the parameters are bound to. It’s important to be able to refer to a “.txt” file because it’s the only way to ensure the parameters will have the same GUID, and that they will actually be “shared”. 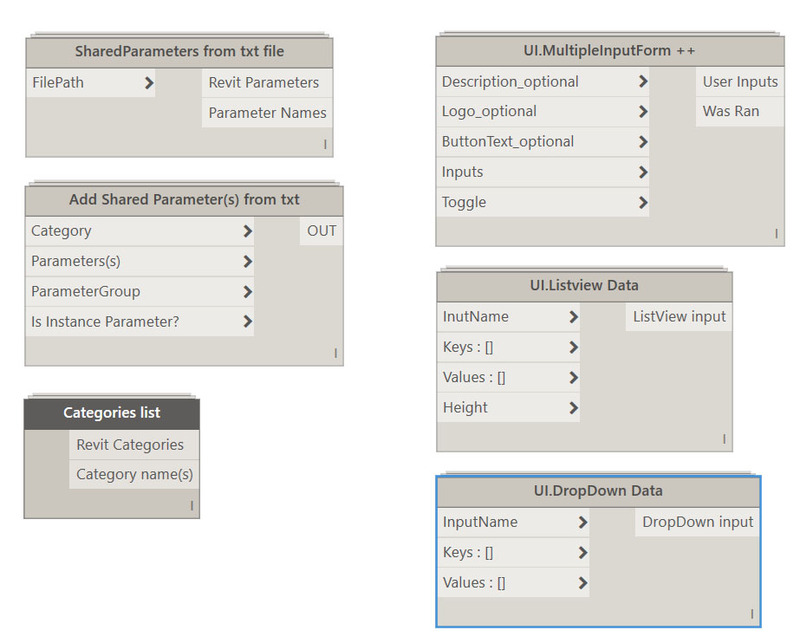 Shared Parameters from .txt file returns the Revit parameters contained in a shared parameter .txt file and their names. Add Shared Parameter(s) from txt uses the parameters extracted by “SharedParameters from txt file” node . Categories list gives out the inputs that will later on help create a ListView or DropDown input in a form. You can find all the information about the new UI nodes on this post. you can download the .dyn here . This workflow is a good exemple of how you can set the Input list for the new UI.MultiInputForm++ node. Please comment if you need extra information or if you have ideas for improvements! Looking forward to trying these out- thanks for the effort! Nice work ! Your nodes are really impressive ! There is actually a Archi-lab package node to do it (View.OverrideGraphicsSetting) but I don’t want my users to enter data for color instead of clicking on a color of their choices. Hi Adrien, first of all thanks for the kind words! But either way, I think it’s a good idea. I will work on it a little more and publish it on the package . Hello Mostafa. Great tool again. Is it possible to adjust the workflow instead of categories the selection method to be with all elements of a family? I try it, but my Dynamo in Revit 2017 reply me, it can’t find the Arch-Lab Node “Parameter Group” after instal the “arch-lab.net”-Package. 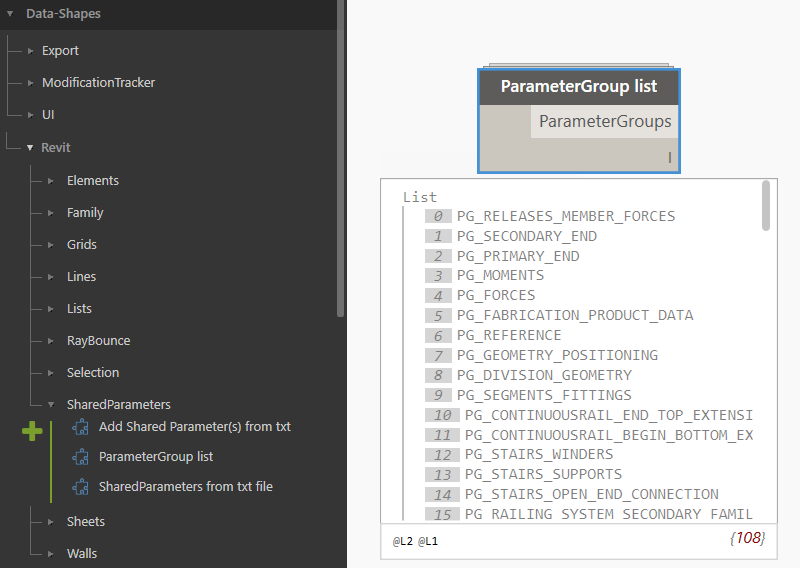 the “Parameter Group” node has indeed been removed from archi-lab.net. I created a similar node and added it to the Data-Shapes package, that way this kind of issues won’t happen anymore. Please update the Data-Shapes package to the 2017.01.16 version and download the updated workflow here : https://drive.google.com/open?id=0B9v9Y2txZ3IeNEJ2NDhfUmVGV1E . now i can use it. 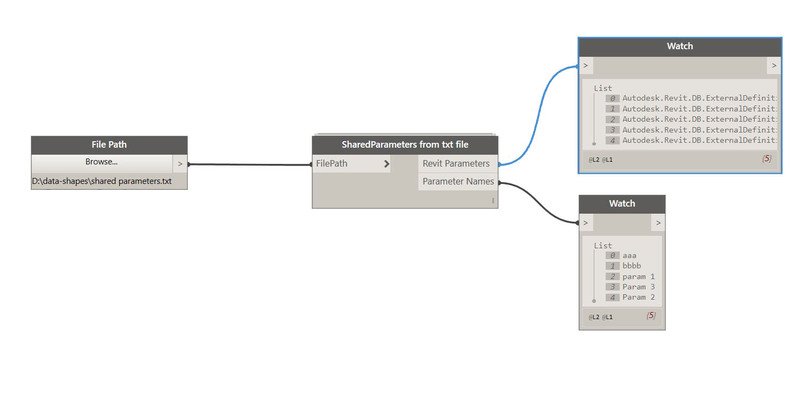 Is there a way to only use the nodes for adding Parameters from the Shared Parameter file and adding multiple categories to a parameter? don’t hesitate to ask on the forum if you need further help. Is it possible to do it by an Excel Sheet? Now I’m using an Excelsheet to make the Shared Parameter File. Because I’m using an Excel Sheet I have lists in lists. Yes it is possible. 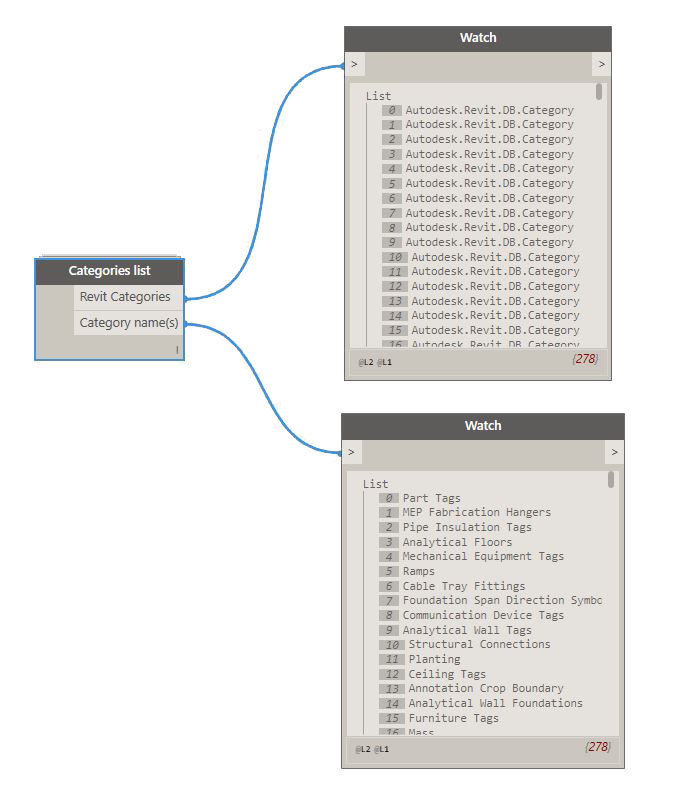 But Excel gives you strings, you need to find a way to get the categories by their name which is possible with Category.ByName node. If you post a screenshot of what you have so far on the forum I’ll be glad to hepl. probably a stupid question but how can i add a screenshot? You can add it through google drive. I think the forum ( https://forum.dynamobim.com/ ) would be the most appropriate place to discuss this topic. but when i run the script through the player, i don’t get any of the D|S pop-up boxes requesting the information from the user. so i just get an error : no item exists at specified index. I’m affraid the latest update of the package messed a little with thi input nodes of the UI.MultipleInputForm++ node. I think replacing the existing UI.MultipleInputForm++ node by a new one (not copy-pasted) will solve your problem. oh fantabulous. yes, i replaced the nodes and everything works fine. I tried to run the Dynamo but it shows an error message due to the index range. I tried what you told to Emily, but it still doesn´t work. I cannot find the mistake! Hope you can solve it! I just updated the script. It needed some minor tweaks because of the package udpates. please let me know if it solves the problem for you. I have had run the script correctly . But the problem is that the parameter that I loaded doesnt appear in the selected Category . I tried to loaded manually but appears the revit window : The selected parameter has already been added. Then I have look into Project Parameters and click modify . I have notice that the parameter is loaded with the right group parameter but not with the Category which I selected to be loaded . The selected category doesnt appear in the Category list . Why does it shows run completed ,but the window to select the txt file didn’t show up? -What version of the package are you using? -Are your packages located in the default location? I downloaded the .dyn. Looks to be plug and play. I pointed to my shared parameters file. Selected categories, parameters, and group. Returns 0 parameters added. Help Please. After some trials I found out that I had to be picky with what categories I added at the same time. Works like a champ. Thanks. Great Work. Thanks for your comment. Glad you could sort it out ! Hi Mostafa! Your script looked very promising and I hope I can get it running. I tryed to use dyn-files that you have uploaded previously, but script was running without any results (without warnings either). Could you please help me and tell what I am doing wrong? Indeed, the updated of the package that occured after this workflow was posted brought the need to activate default values in some of the UI nodes. You did a good job rebuilding the workflow. The only problem you have is the value you feed the “Height_Optional” input of one of the UI.ListView Input nodes. You input “150” as a string. If you get rid of the quotes it’ll become a number and everything should run fine. Thank you very much for quick response. The problem is solved! I have been looking for such a script for two days. And now it works just fine! Great work as usual! Does this only work in the project environment? I have tried it in the family editor but it doesn’t seem to add the parameters. i don’t know why i have got this warning from last code block? Make sure you right click on the inputs of the Data Shapes nodes and activate default values. It should solve your problem. Really good job, this script is so usefull! I am using the 1006207 script. After loading the .txt file and opening it, neither the shared parameters, nor the categories display. The Data-Shapes package has been updated several times since this script was uploaded so there is one thing you need to do : Right click on all the inputs of the Data-Shapes nodes and make sure the default value is activated (you only have to do this once). This is described at the beginning of the latest blog post. Please let me know if this solves you issue. This is great! I downloaded the script and it wasn’t working at the beginning. However, I was able to make it work looking at the comments above. Thanks for your message Luis! You are describing the exact same issue as many people have in the previous comments (default values activation) , the solution to the issue has been given. Please try and let me know how it goes for you.